What do you think about this for a modified Ulmus? 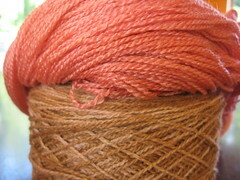 I have 1200 yards of the sandy color and 800ish of the pink. I could make a huge Ulmus by knitting until I ran out of pink and then beginning the border. In addition to the size, the other change will be the border. While the original pattern is lovely, I do not want a peaked edge border. Here in the soggy US Pacific Northwest/Canadian Southwest (Hi Kate!) points do not stay blocked. I have a straight edged border in mind. I like that! And a straight edge border would be lovely on it. I must say, not feeling so soggy here in the Cdn SW, but I know that will change in a month or so! I think I'd have to see the two colors in person to say for sure. Then again, what good is advice from the person who keeps saying she really wants to start an Ulmus, but who then can't ever decide what yarns to start it with! Maybe that should be my goal for this week - to start an Ulmus.